Five years after the roadside bomb blast that left him fighting for his life, Cory Remsburg, the Army Ranger who was honored by President Obama at this year’s State of the Union, is getting some of his independence back. If all goes to plan, a Gilbert home that several donors are remodeling for him will be ready for move in before Christmas. The house was purchased earlier this year for $256,000 by Army Ranger Lead The Way Fund, a non-profit that supports disabled U.S. Army Rangers and has assisted Remsburg and his family since he was injured in Afghanistan on Oct. 1, 2009. Remsburg’s father Craig said the home is a major steppingstone in his son’s recovery. Right now he lives in an apartment with a caregiver. “They’ve taken everything that Cory needs and are accommodating that so we are very excited for this next step in Cory’s life,” he said. 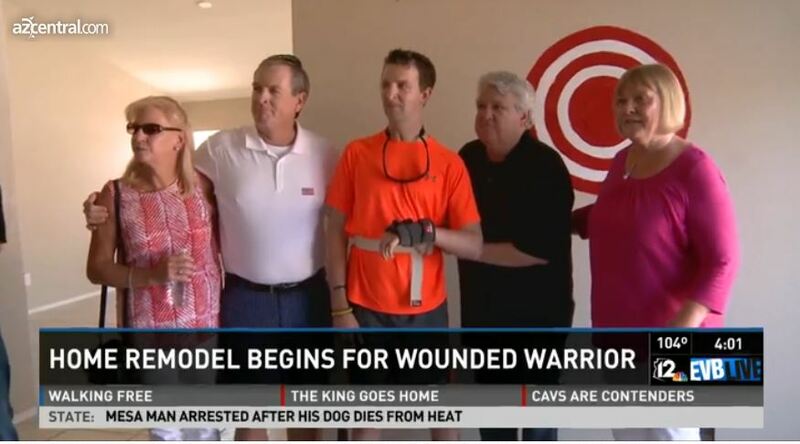 Lead The Way Fund teamed up with NFL player Jared Allen and his charity Homes For Wounded Warriors to remodel the home so it fits Rembsurg’s needs. The additions include a wheel-in pool, a therapeutic spa and a large gym for Remsburg’s rehabilitation. A separate guesthouse is being added for his caregiver and doors and hallways are being widened. “He’ll have his pool to do his exercise, he’ll have an exercise room to do his rehabilitation, he’ll be able to live as much of an independent life as possible,” James Regan, Chairman and CEO of Lead The Way Fund, said. Construction began this summer and is being handled by veteran-owned Peak One Builders & Restoration in Scottsdale. Ownership of the home was handed over to Remsburg for his 31st birthday earlier this year. The renovation is expected to cost about $413,000, and is being paid for by the two charities and a federal grant. Remsburg was on his 10th deployment overseas when his platoon was hit by a roadside bomb in Kandajar. He spent three months in a coma and had to relearn how to walk and talk. Today he is blind in his right eye and his left side is partially paralyzed. Still on active duty, Remsburg is expected to be discharged in 2015 and would like to continue public speaking and supporting various charities. This year alone he has given more than a dozen speeches and later this month will be giving a keynote speech for former First Lady Rosalynn Carter’s Institute For Caregiving. Craig Remsburg said the home will significantly help his son’s transition to civilian life. Allen, who is a defensive end for the Chicago Bears, has become close with the Remsburg family and said working with them has been humbling. “They are just super welcoming, super friendly and appreciative,” Allen said. He founded his charity after visiting soldiers in Iraq and Kuwait in 2009. The goal, Allen said, is to make a daily impact on veterans’ lives. In addition to Remburg’s, his charity is working on seven other veteran’s homes, including two more in Arizona. “I always say that I get more out of this than what I’m giving because it just humbles me to my core every time,” Allen said. The Valley’s historic rainfall has delayed construction of the backyard, but Alex Karalexis, project manager for Allen’s charity, said Christmas is still the target. For each home Allen and his charity remodels, they try to add something special, which Karalexis said can be difficult to do because veterans are usually reluctant to have their homes remodeled in the first place when they see the cost. “You almost have to convince them to do the project because they always think that there is somebody more deserving,” Karalexis said. For his special addition, Remsburg chose to have a tiki bar and a memorial. Remsburg’s father said his son still hasn’t decided on the memorial’s details, but that it will honor soldiers who have lost their lives.